Thieves Oil is a blend of five essential oils that are highly effective in supporting and aiding a healthy immune system. Thieves essential oil is a safe and natural way to care for your family's health. All members of our family, even our children and babies, use this remarkable oil. Young Living Thieves® Essential Oil is a proprietary blend of five different therapeutic grade essential oils, including cinnamon, clove, lemon, eucalyptus, and rosemary. This combination of oils covers a broad spectrum of natural health supporting properties. All members of our family, from our youngest to our oldest, and even our pets, use this oil. The benefits of Thieves Essential Oil make it one of our family's favorite essential oil blends. and much more... It is a highly versatile oil blend. Chances are you have heard at least one version of the 17th century story of the "four thieves" and their secret formula or recipe. There are many variations of this story, including four thieves, five thieves, spice traders, apothecaries, etc., and how they survived the Black Death or Black Plague. Each story has it's own list of herbs, spices, oils and vinegar's that they rubbed all over their bodies. I have heard that there at least 17 different versions. The most famous or popular story is about a group of spice traders who turned into thieves after an outbreak of the highly contagious and deadly Black Plague. It is reputed that the "four thieves" were protected from these highly virulent germs as they robbed the bodies, even going into the homes, of dead and dying plague victims. During the course of their plundering, and grave robbing, four of the thieves were caught by the king’s men. Standing before the king, the four thieves disclosed the secret of their immunity, their secret recipe, in exchange for a more lenient sentence. After learning the four thieves secret formula, the king had the thieves oil recipe posted throughout the city. It is my understanding that the "Story of Thieves," is recorded in the Royal English Archives. We have many family recipes and uses for this versatile oil. You will find the recipes we use to clean, the recipes we use for health and wellness, diffusing, recipes for personal care, and how we use it for our babies and children. 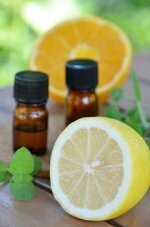 See "Thieves Oil Recipes and Uses"
These are all excellent ways to support your family's health. As you use Thieves oil you will discover for yourself, more and more, all the variety and creative ways to use it... and and of it's numerous benefits. Thieves has a beautiful cinnamon fragrance. Cleaning your home with Thieves will leave a clean, naturally healthy scent. It helps to clean everything from laundry to counter tops, and just about everything in-between. Now this puts it above the rest...unlike chemical cleaning products, inhaling it while you clean can help support your immune system. Plus you are not exposing yourself or family to dangerous chemicals. This is versatility at its best! You can make your own DIY Thieves cleaning products or check out Young Living's plant based Thieves Product Line for household cleaning. These products make it easy to bring the powerful benefits of Thieves essential oil into your home. Diffusing with an essential oil diffuser is a great way to get this health supporting blend into the respiratory system of household members. Inhaling diffused Thieves® Therapeutic Grade Essential Oil can support the lungs, aid the immune system, and give support to sinuses. In addition to diffusing throughout the day, you can diffuse Thieves essential oil in the bedroom at night, during sleep. It is a wonderful way to give added support for healthy, lung, sinus, and immune health. This is valuable during the winter months! The benefits of diffusing thieves not only include adding a pleasant cinnamon aroma to your rooms but also freshening the air and naturally eliminating odors (not just masking and covering them up). Thieves® is an amazing oil for boosting and supporting the immune system. This is the main way our family uses it. If anyone's immune system is stressed this is the first oil we use, along with Lavender. It truly has powerful healthy immune supporting properties. If I want to give our immune systems additional support, I increase the frequency of applications.There are occasions when I apply Thieves every 20 minutes for the first hour, then every 30 minutes over the next 2-3 hours, and then I taper off to every few hours. I always dilute the essential oil when I increase the frequency, due to the increased chance of skin sensitivity. I massage Lavender and Thieves into the lower back and then into the muscles up along the spine. I also vita-flex Thieves Essential Oil into our feet. Massaging the feet and back is not only relaxing and therapeutic it gives the immune system a quick boost. Thieves oil can be diluted and massaged directly into the skin to support and aid the immune system. Two very effective areas to massage are the feet and up along the spine. You can also apply it to the chest over the lungs. The feet have reflex points that when massaged will support specific areas of the body. See vita-flex points on the feet. Always dilute for babies, children and pets. Diluting Thieves essential oil in vegetable or carrier oil before applying to the skin is recommended. The bottom of the feet is always the safest place to use and test oils, especially on children and those with known sensitivities or allergies. The bottom of the feet is also a highly effective place to use the oils due to the large pores there.They are absorbed here easily and quickly. For your health and safety always test for sensitivity first! 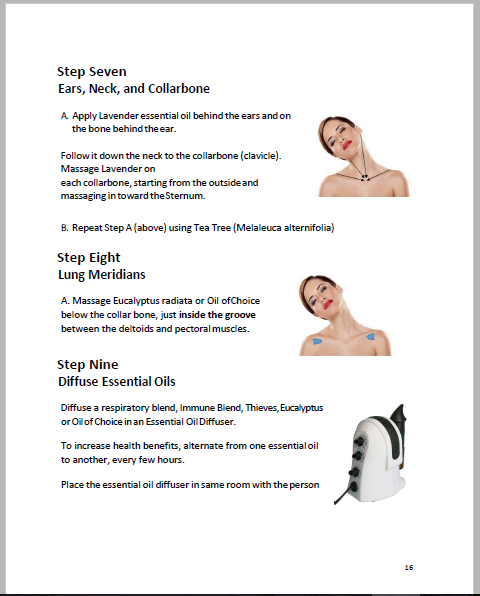 If you would like clear, visual, step by step instructions for Respiratory and Immune Support see the "Essential Oil Quick Reference Guide". It is available for purchase as a PDF. It is my personal protocol for fast and intense respiratory and immune support, using essential oils. Young Living Thieves Oil can be taken internally with capsules as a supplement, in honey, mixed in warm water to make tea, mixed into applesauce or yogurt, and even dropped directly on the tongue. Internal use is not recommended for children under the age of 12. Young Living has easy-to-swallow, liquid soft gels, that dissolve quickly in the stomach called Inner Defense. It is a supplement specifically designed to boost the body's immune system during times of stress. It contains Thieves oil blend, oregano, thyme, and citronella essential oils. This essential oil blend is is a natural and powerful way to support your body in health, so it can stay strong. It is your body, and your miraculous immune system, that protects and heals you. With utmost sincerity we caution you to always use common sense and to seek professional medical help if necessary. Life is precious. Family is precious. Our family honors both nature and medical science. We understand there is a time for each, and we respect the wisdom of both. Our family only recommends Young Living, Therapeutic Grade Essential Oils. They are rigorously tested, "In house AND third party", to ensure their safety, purity, and that they meet Young Livings high standards. All are 100% guaranteed. Young Living is truly a company that is trustworthy and reliable. They are respected the world over for their high standards. They are the World Leader in essential oils and have only the highest quality, therapeutic grade oils...scientifically confirmed, over and over, by researchers, scientists, and in state-of-the-art labs. These are the oils our family trusts and we have used them for over 15 years. Why? Because they truly do work. The Natural Aromatherapy Benefits that we share on this site are only from Young Living Therapeutic Grade Essential Oils.